After a long hiatus, I am excited to announce the launch of a new children’s book series we’ve been working on at Bon Education. I hope you enjoy BB and Sam: The Return of the Champion book one of The Adventures of BB and Sam series. To download the book, visit www.BBandSam.com. Bon Education creates innovative multi-media children’s book series, The Adventures of BB and Sam, using Apple iBooks Author. Dubai, UAE – May 15, 2012 – Education technology company Bon Education announces the launch of The Adventures of BB and Sam – a new multimedia fiction book series that aims to take children on virtual adventures around the globe via the touch of an iPad. Created with Apple’s iBooks Author, the series is filled with text, illustrations, videos, mood music, photo galleries, quiz features and more. “When we started working on the first book of the series, BB and Sam: The Return of the Champion, we originally conceived of the book as an app. The story takes place in Thailand so we spent a great deal of time traveling around the country doing research and collecting videos and photos to supplement the written storyline so that our readers could get a real feel for life in Thailand. iBooks Author enabled us to create the book as a multimedia e-book instead and gave us much more control over the creative process” stated Christopher Batchelder, Bon Education President. With book one now on the Apple iBookstore, the Bon Education team is eager to see how children and families around the world react. In the prototype phase the team worked with children in the UAE, Egypt, New Zealand and North America to get feedback on the story and visuals. When asked about where book two in the series will take place, the Bon Education team did not want to reveal too many details. But, they said there is a good chance BB and Sam will be heading to the Middle East next winter! Bon Education is an education technology company based in Dubai, UAE with team members in the United States, Middle East and Asia. The company focuses on developing engaging and culturally relevant educational programs and learning products for families and schools around the world. To learn more about The Adventures of BB and Sam visit www.BBandSam.com. Book one of the series can be downloaded for iPad on the Apple iBookstore. Familes can stay up-to-date on the travels of BB and Sam by following the multimedia e-book series on Facebook. Who doesn’t like free books?! A colleague recently reminded me about Google Books. As a lover of books and all things digital, I have to say… Google has done it again! What a great resource! Bravo! The New York Times just published a slide show of the best illustrated children’s books of 2007! Have a click through! 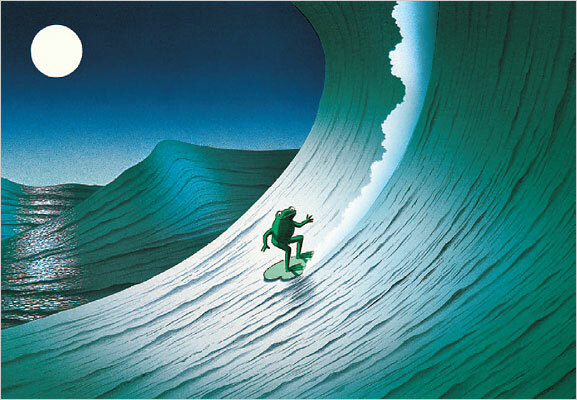 I am particularly fond of the illustration featured above from, “The Frog who wanted to See the Sea” written and illustrated by Guy Billout. Who doesn’t want to surf and think of turquoise waters when it is 30 degrees outside? !